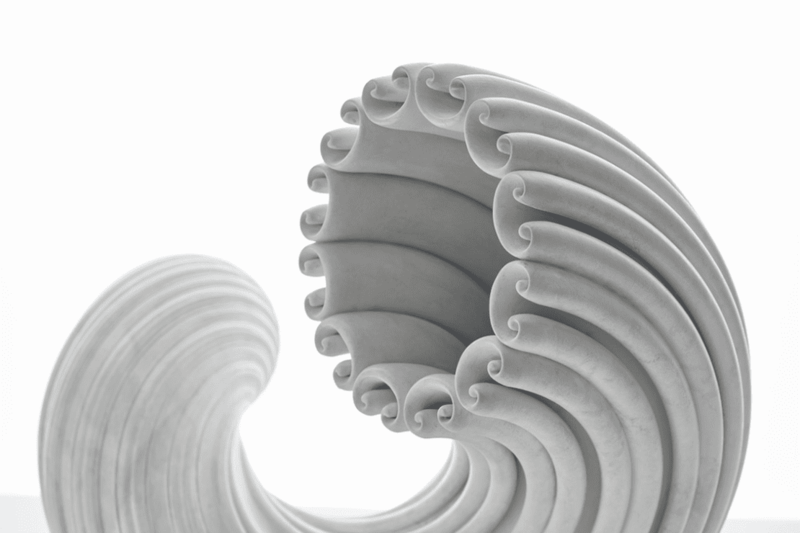 Michael Eden, Spiralis, 2018, detail; unique object made by Additive Layer Manufacturing from a high quality nylon material with a soft mineral marble coating. © Michael Eden. Image courtesy of Adrian Sassoon, London. Courtesy of Adrian Sassoon, London. Photography by Sylvain Deleu. 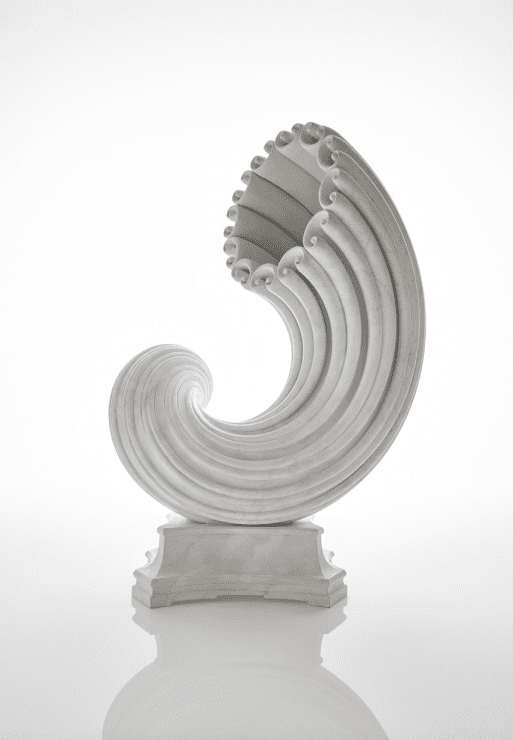 Michael Eden, Spiralis, 2018; unique object made by Additive Layer Manufacturing from a high quality nylon material with a soft mineral marble coating. © Michael Eden. Image courtesy of Adrian Sassoon, London. Courtesy of Adrian Sassoon, London. Photography by Sylvain Deleu. 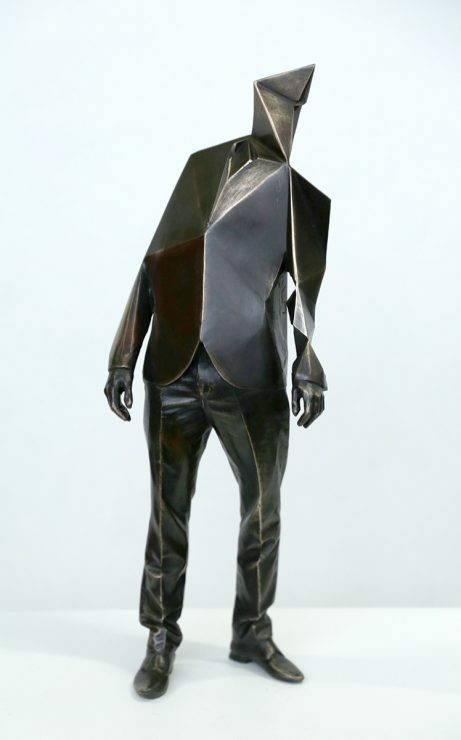 Louis Pratt, Digitised man, 2018, bronze, 30cm h x 15 cm w x 10 cm d, edition 15. 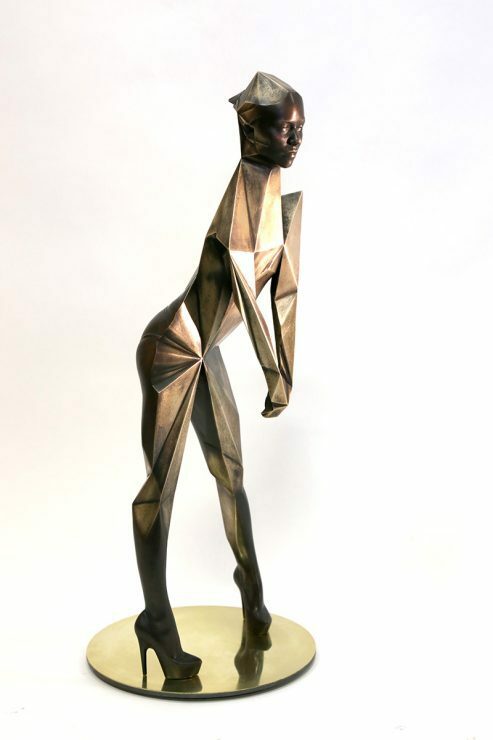 Louis Pratt, Avatar, 2018, bronze and brass, edition 9, 80 cm h x 30 cm x 30 cm. 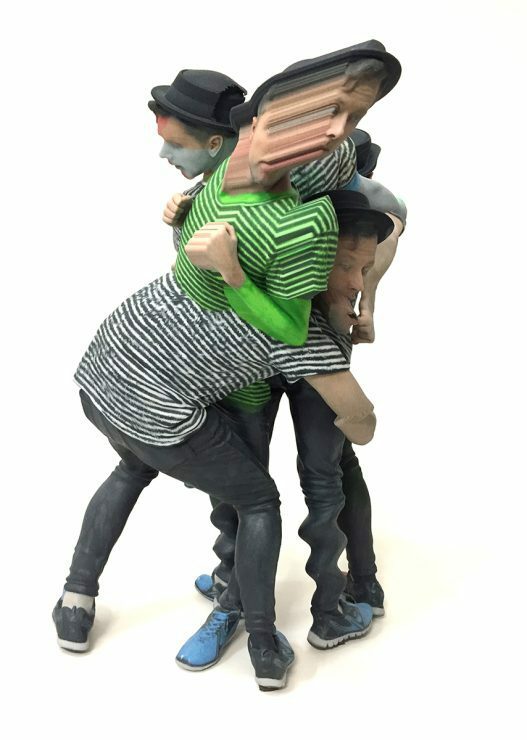 Louis Pratt, Future Events, 2016, 36cm h x 24cm x 23 cm, colour resin print edition 3, winner Tom Bass figurative award 2016. Kate Dunn, Scorcher, 2016- 3D powder printed, sugar and porcelain. The work is a model of the temperature spikes of January 2015 in Sydney. Data for the work was supplied by Dr. Sarah Perkins Kirkpatrick a climate scientist, who researches the effects of heatwaves. Photograph by the artist. 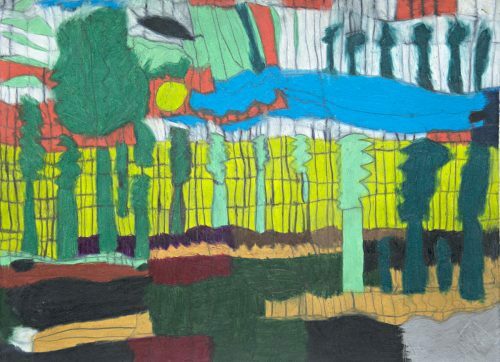 Art has always been affected by new developments in technology, from egg tempera to Photoshop. 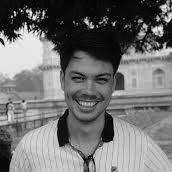 Tai Mitsuji spoke to Louis Pratt, Grace Blake, Kate Dunn, and Michael Eden; four artists who are making the most of innovations in 3D printing, as a means rather than an end. While 3D printing still feels more affiliated with the future than the present, it might better be described as a product of the past. Because, despite its permanent sense of newness and seemingly rapid development, the origins of 3D printing stretch back to the early 1980s. 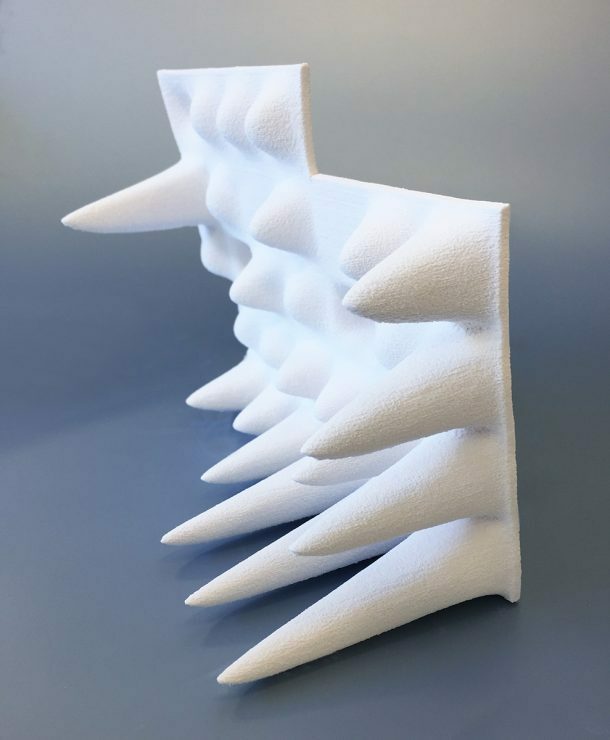 The 3D printing process – which at its most basic level just involves the adhering of cross-sectional layers together – is almost the perfect analogy for its own gradual evolution. With every technological development another thin layer has been added. Alone they are imperceptible, yet over time we have come to witness their cumulative effects. Of course, there have been thicker layers: from Charles Hull’s invention of the first stereolithography printer in 1984, to Dr Adrian Bowyer’s democratisation of the technology through open sourcing and the RepRap project in 2005. Yet constant additions have continually arisen out of various fields. And 3D printing is now being used to fabricate apartment blocks, produce artificial vertebrae, and design consumable meals. 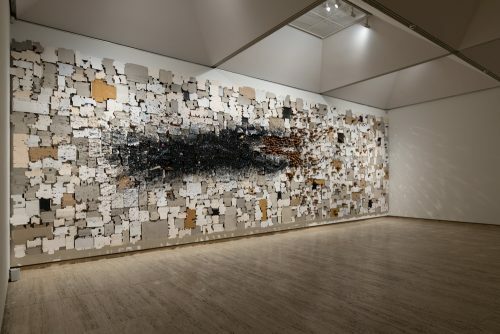 It is therefore perhaps unsurprising that this technology has found a home in contemporary art, a discipline whose boundaries have always been renegotiated by new influences. In order to go beyond the optics of innovation and to truly understand its practical effects, I spoke to four very different artists about the same thing. From the beginning, artist Louis Pratt saw 3D printing as not only opening up the future, but also farewelling the past. “Friends in architecture introduced 3D printing to me,” Pratt recalls. “And it was really the case of me going, ‘Wow, I can see that if you can 3D print something, what value is a sculptor?’” While Pratt’s statement is undoubtedly cavalier, it captures the perceived threat of the newer medium and its seemingly indelible effect on the creative fields. Just as the rise of early photography affronted the old guard in the 19th century, it is easy to see how a similar anxiety could be provoked by the 3D printer. And perhaps that is, or for a time was, the appeal of 3D printed work: its inherent provocation. Pratt’s early acceptance of the technology set him up to eventually create Future Events, a work which was fabricated entirely with 3D printing, without any physical intervention from the artist. But for Pratt, that was the point. “Future Events won the Tom Bass Prize for Figurative Sculpture in 2016, and I did it specifically to make something that would probably irritate that crowd,” Pratt recalls. “Because they were a very classic sculpture school, and I didn’t touch this work at all.” Yet Future Events is not one of Pratt’s typical works; in fact, it is self-consciously different from most of his other pieces, which are only partially fabricated by 3D printers, before they are worked on by hand. I had always envisioned that the process of printing an artwork involved the click of a button and a little bit of patience, yet Pratt assures me that this is far from his reality. “It’s actually quite labour intensive, once I get it out,” he explains. “A 3D printer only has a certain level of resolution, so I’m often adding plasters or plasticines and then remodelling the 3D print.” While this sounds innocuous enough, the idea of adjusting a printed artwork critically brings the sculpture closer to its traditional counterpart. Indeed, the 3D printed artwork arguably becomes a continuation of, rather than a departure from, the established genealogy of sculpting. Somehow, the presence of a human hand makes the 3D artwork feel less alien. This difference becomes apparent when I ask her why she chose to print work for her latest exhibition rather than making it by hand: “I would have had to learn a whole new skillset to make ceramic parts,” she replies. Reflecting on our conversation later, I was surprised to realise that my query demonstrated an inherent conservatism in its expectation of how art is created. While much of our discussion was characterised by the practicality of the technology, moments such as that one still demonstrated the impact that these new technologies have on dissolving our fundamental assumptions. 3D printing has meant that the starting point for a sculpture is no longer just a hammer and chisel, but also a keyboard and mouse. But when I speak to academic and artist Dr Kate Dunn, she is also quick to dismantle the idea of technology as the sole driver of an artwork. “Like anything it is a tool, what you do with it, is what counts,” Dunn asserts. Of course, this is a simple, even intuitive, idea, yet the weight of 3D printing technology often pushes the discussion of such artworks towards the medium rather than the maker. 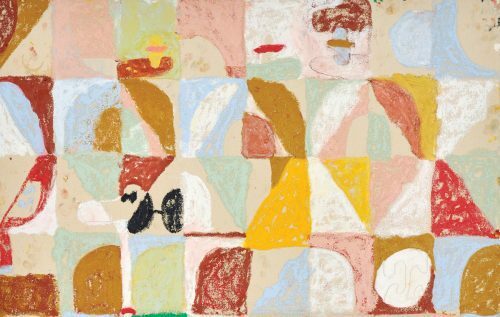 And while conceding that early artworks “may be more influenced by the quirks of the beta technology rather than the creative ideas informing them,” Dunn believes that we have moved beyond this dynamic. “I think the creativity and material knowledge that comes from the art disciplines is actually a huge value-add for 3D printing, rather than the other way around,” she continues. “At one stage, the most popular item that was 3D printed was a statue of Keanu Reeves. It takes artists to see all the possibilities of the process.” Indeed, celebrity effigies have been left behind in Dunn’s own practice, as she has instead focused on producing works that are based on climate change data, and introduce sustainable materials into the 3D printing process. Kate Dunn, Heatwave, 3D printed recycled wood and PLA filament. Photograph by Greg Piper. I get the sense from the artists that they are keen to have 3D printing regarded as just another facet of their practice – rather than a point of distinction. Yet, as the very focus of this article indicates, the broader perception of 3D printing lags behind this desire. Put simply, it is still thought of as different. So why is it so unique? For long-time practitioner Michael Eden the critical difference resides in its ability to defy the typical pressures of physics. “In sitting on the potter’s wheel and throwing a pot, you have the limitations of gravity, centrifugal force, and other material properties of clay,” he explains. “But with the technology that I’m using those considerations hardly apply.” Indeed, Eden confesses that he would not invest “hours, days and weeks in front of the software” otherwise. 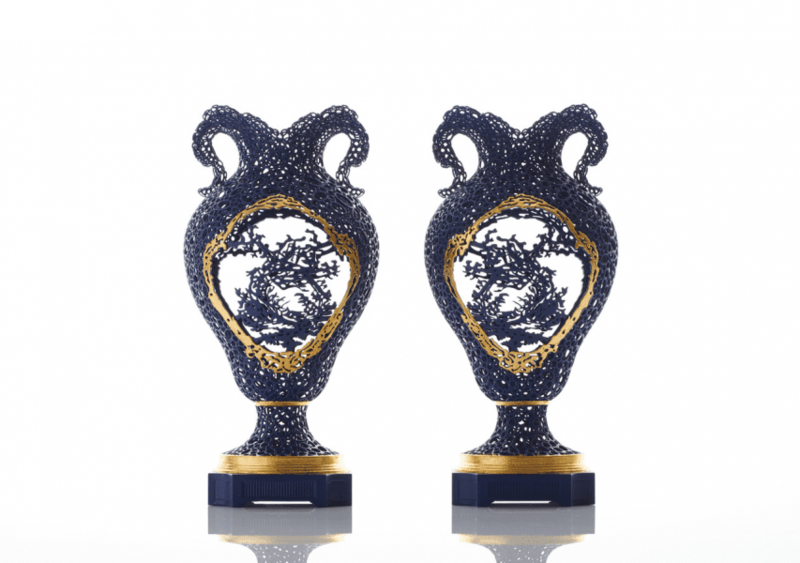 Michael Eden, A Pair of Caillouté Vases, 2018; unique objects made by Additive Layer Manufacturing from a high quality nylon material with a soft mineral coating and gold leaf. © Michael Eden. Image courtesy of Adrian Sassoon, London. Image courtesy of Adrian Sassoon, London. Courtesy of Adrian Sassoon, London. Photography by Sylvain Deleu. As with Dunn, throughout our conversation Eden returns to the importance of the idea over the mode of delivery. “I’d like to get beyond the new technology, and 3D printing being groovy, fashionable and new,” he says. “I’d like it to become just another tool.” It is interesting to hear such sentiments from an artist whose practice has more than likely benefitted from this very technological fetishisation. Yet, clearly, this is an exchange that Eden is willing to make. And one does get a sense that this is an exchange which is underway. Would Louis Pratt’s sculpture Future Events really be that provocative now, two years later? Perhaps not. Will it be in another decade? Undoubtedly not. The contours of 3D printing are shifting as the novelty of the medium is being overtaken by the ideas that drive the art. And, almost imperceptibly, its seems that change is slowly occurring. Layer by layer. The lived experiences of Marlene Gilson and N.S. Harsha are separated by both time and space.